Rattlesnake Arch is an iconic location of Rattlesnake Canyon, both found withing the McInnis Canyons National Conservation Area. The trek to arrive at this point is brutal, even with 4WD, but the rewards on an evening like this can’t be measured. 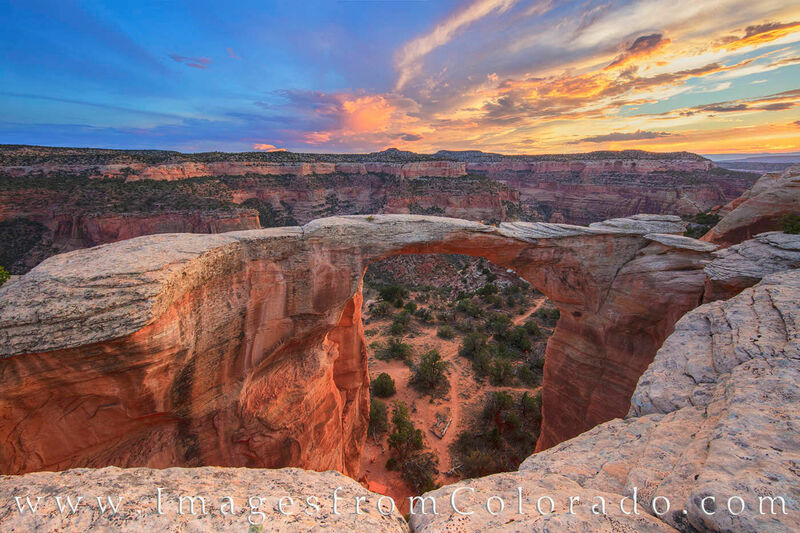 Taken a little after sunset, the sky above this beautiful sandstone arch lit up in orange and blue, while beneath it the rock seemed to glow in shades of red and orange. This area is just west of Colorado National Monument and Grand Junction. To arrive here requires either a 15 mile round trip hike - up 3,000 vertical feet, or a sturdy 4WD truck that can withstand brutal rocks, drops, and craters, that most cars could not take. Even then, there is still about 2 miles of rocky terrain to cover by foot. But it is all worth it… This area is simply amazing. Photo © copyright by Rob Greebon.